Colorado was the final stop in 2016 for a significant number of the 3.25 million lambs raised in the US. John Wilkes reports. The lambs originate in mostly Western rangeland states, Texas and New Mexico and are produced by a national flock of 3.86 million breeding sheep. Denver, the ‘mile-high’ city, at an elevation of 1,500 metres (4,920ft), with its 300 days of sunshine annually and cold, dry winters is an ideal feedlot location for finishing lambs. 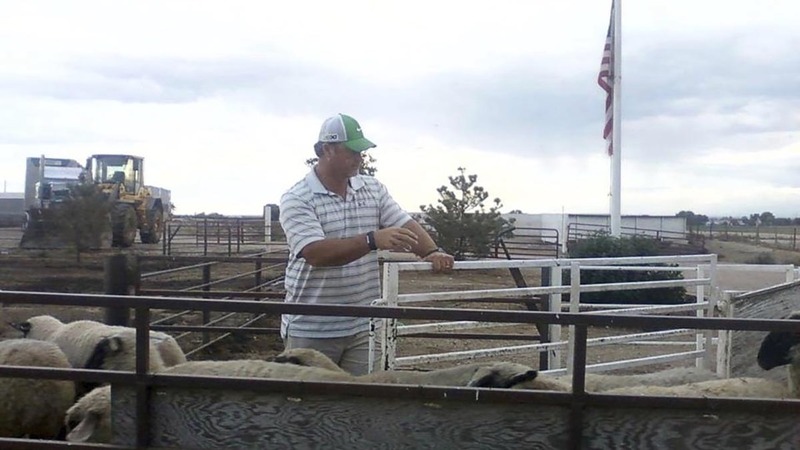 Each season more than 400,000 ‘feeder’ lambs are finished in the area before being processed at Mountain States Lamb Cooperative and Superior Farms. Double J Lamb Feeders, owned by the Hasbrouck family, has contract fed lambs for more than 50 years. Located in Ault, near Denver, it was built in the 1960s then bought in 1998 by Jeff Hasbrouck’s father, a third generation lamb finisher. At peak operation the company has capacity for 85,000 lambs between its two locations and leased cattle feedlots. Its total annual throughput is 200,000-head. Double J has more than 60 customers with 45 currently active. Some are producer/finishers and others place purchased lambs with the company. 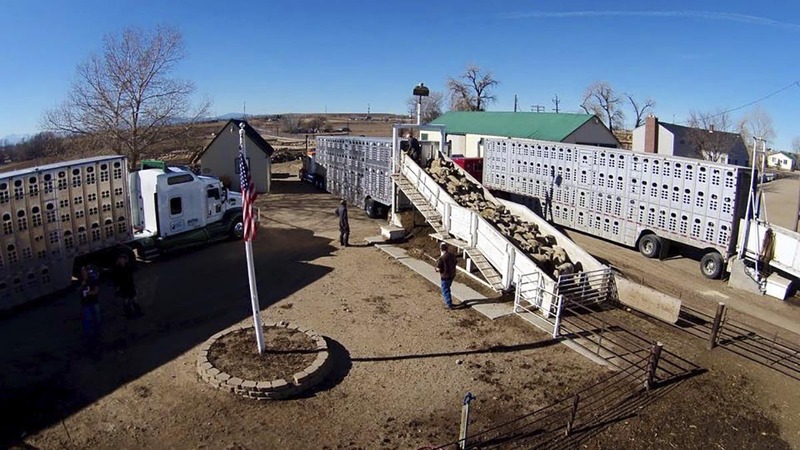 Sheep passing through Double J’s facility to be processed at Mountain States and Superior Farms must comply with their ‘All Natural’ and ‘Pure’ welfare codes. Hormones and growth promoters are not permitted, although within the US sheep sector hormones and growth promoters remain legal. Should antibiotics be used to treat an animal, it becomes ineligible for entry at either Mountain States or Superior Farms. Sheep producers are required to sign a declaration of welfare compliance for lambs sold to commercial feeders and/or self-finished. Subsequently, all lamb owners, Double J and transport companies must sign a welfare and management affidavit. Mountain States and Superior Farms audit farms unannounced twice-a-year. Long-term success for Hasbrouck’s business hinges on ‘cost of gain’. To add 0.45kg (1lb) of weight to a lamb at their feedlot, costs about $0.70 (£1.28 per kg). This equates to about £32 to take a 45kg lamb to finish at 70kg. On average, lambs are weighed and physically sorted four times while at Double J. The cost of gain includes all expenses incurred such as vaccines, wormers, external parasite pour-ons, shearing, feed and labour. Strict adherence to specific health protocol with regular monitoring by skilled employees affords the lamb mortality rate of 1.9 per cent. Double J has a strict health regime. On arrival lambs receive the first of two seven-way Clostridia disease vaccinations. Problems can be triggered by the stress of location and diet change. Lambs are treated with moxidectin or doramectin injectable wormers and a pour-on is administered to clear up keds, ticks and lice. Double J charges a 20 per cent markup on drenches and vaccines. A £0.10 per head ‘shute’ handling charge covers needles, drenching guns and associated labour. An important aspect of feedlot lamb management is shearing. A purpose-built shearing shed with a wool press is on-site at Double J. On average, 1.8kg of wool is removed at a value of £3/kg for whiteface lambs and £2.40/kg for cross-breds. Shearing has two purposes; to keep lambs clean for both processors and pelt curer plus to improve growth rates. The shearing process can even out slaughter weights in variable batches of lambs. Feed costs affect overall profitability. For more than 20 years Double J has employed a full-time nutritionist Bud Patterson. The feedlot has lambs on six different rations which further complicate matters. Alfalfa hay, ground on-site is a key ration component and wherever possible Colorado-sourced maize and sun-cured alfalfa cubes are used. To facilitate transition to better nutrition and add weight rapidly and efficiently, Double J has developed a five-step programme. Lambs are fed five different ‘step-up’ rations four days each until day 21 when they receive a finisher ration prior to slaughter. During this five-step stage, maize content increases gradually from 25 per cent to 85 per cent at finishing. Protein levels reach 15.4 per cent and then flatten out to 13 per cent in a final blend consumed through to finish. This step process is critical because lambs will ‘shock’ and suffer growth setbacks if maize ration content were to increase too rapidly. Mr Hasbrouck says: “A 34kg lamb is ‘stepped up’ more slowly than a 56kg lamb; we do not rush them. A recent ration addition is steam-flaked maize. This has proven to increase daily liveweight gain by 10 per cent and improved feed conversion by 6.5 per cent to 7 per cent. In order to avoid seasonal price fluctuation, advance contracts for maize purchases are negotiated. The special formulated mineral supplements Mr Patterson developed include extra calcium, trace elements and vitamins to balance high maize rations. These supplements are manufactured as pellets and crumbled to ensure lambs intake. Before changing to All Natural, Double J fed Bovatec, an ionophore growth promoter, still licensed in the US for sheep. Mr Patterson was concerned its removal would have a negative impact, but says: “To my surprise we did not see much difference in feed consumption or death loss. Decoquinate, a non-antibiotic quinine coccidiostat, approved for natural finishing, is also fed in the five-stage ration process." Double J prides itself as a showcase for the US lamb industry. It is a large-scale enterprise and no area is off limits to tour groups and visitors are warmly welcomed. Lambs arriving from Imperial Valley, California, at Double J's Denver feedlot.